For someone who is such a watchaholic, it’s taken me forever to find that perfect rose gold and black watch. As much as I love trendy, colourful designs, when investing in a high quality piece, I tend to look for more classic, timeless creations. Michael Hill not only believes jewellery is a “mark of love”, each piece is created by in-house craftsmen, ensuring each keepsake is perfectly designed and made with love. I fell hard for this Michael Hill Black Ceramic & Rose Tone Stainless Steel Watch and immediately knew it needed to be in my watch collection. The combination of both black and rose gold, along with its unique bracelet style band, helps to keep it both classic, but with a modern twist. I love the textured black dial that’s counterbalanced by a lovely rose gold tone hand and makers. This stunning watch instantly gave my outfit a boost and added a little “something extra” to this look. 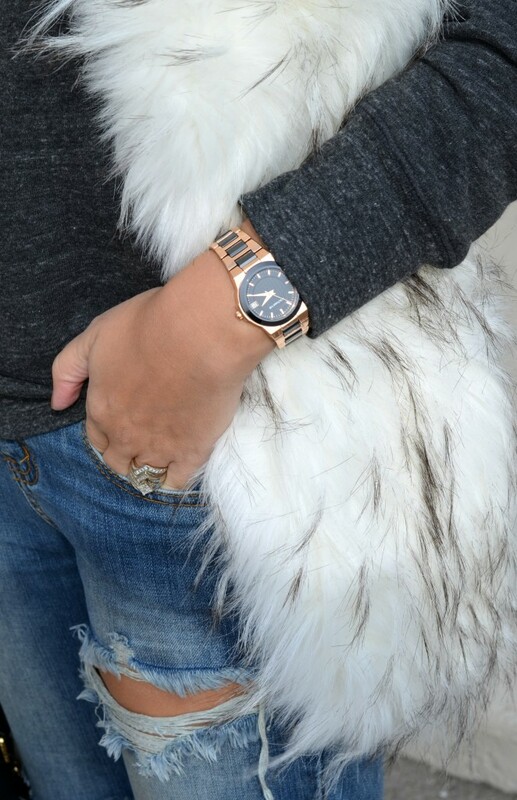 Loving your faux fur stole.